The Springfield community kicked off the holiday season Sat., Dec. 1, downtown with their free annual Holiday in the City. “Santa, Santa, Santa…” the Springfield children cheered to invite Santa to light the tree for the Grand Illumination. Located on Fountain Ave. and High St., the day was filled with events—starting at 1 p.m. with SantaLand, where children go for photographs, to see Santa and tell him what they want for Christmas at the Heritage Center. Holiday in the City is sponsored by The Chamber of Greater Springfield and is not possible without other volunteers and businesses in the community. Hasting & Co. and Griffin House performed on the Main Plaza Stage during the evening. Other performances included choirs and marching bands from schools in the Springfield area—including Wittenberg’s very own Wittmen Crew. Alexander Hallauer, ’19, from WittMen Crew said the day of events gives the community a place to go, have fun and meet new people. He said it is important that the community has things to do together to bring the community closer together. 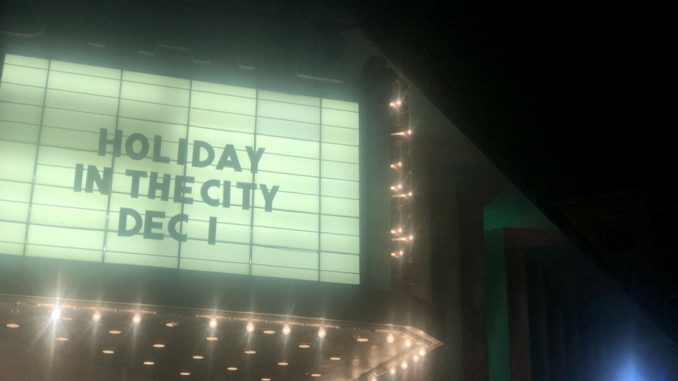 “The Wittmen Crew love to perform any chance we get but getting the chance to perform at Holiday in the City was very beneficial to us,” Hallauer said. We got tons of recognition and we were able to spread our music and joy to this community,” Hallauer said. Filling the day with events, the community was given many options throughout the day including live performances, family holiday photos, rides, vendors and food. There were a variety of food trucks for the community, offering sandwiches, barbeque, fries, chicken, walking tacos, burgers, sausages, pitas, pizza, salads, mini donuts, funnel cakes, cinnamon rolls, coffee, hot chocolate and more. There were vendors selling Christmas stockings, crafts and pictures. There was also a live nativity scene with people and animals, ice sculptures being carved and holiday characters walking around for families. The community, families and Springfield security gathered to welcome Santa’s entrance on a firetruck, where they counted down from five to illuminate the town. Despite the rainy and cold weather, some families stayed until end the day of events with Rozzi’s Famous Fireworks at 7:30p.m.